A precious hoard of Roman and Late Iron Age coins has been discovered in a cave where it has lain undisturbed for more than 2,000 years. 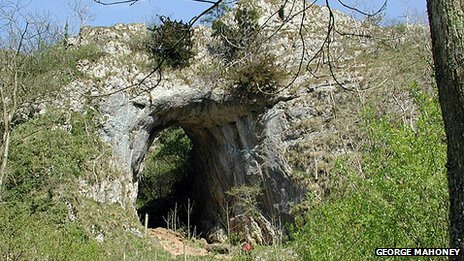 The treasure trove was unearthed after a member of the public stumbled across four coins in the cave in Dovedale in Derbyshire's Peak District. The discovery prompted a full-scale excavation of the site. Experts say it is the first time coins from these two separate civilisations have been found buried together. Archaeologists discovered 26 coins, including three Roman coins which pre-date the invasion of Britain in AD43, and 20 other gold and silver pieces which are Late Iron Age and thought to belong to the Corieltavi tribe. Although Roman coins have often been found in fields, this is understood to be the first time they have been unearthed in a cave. The cache has been declared as "treasure". 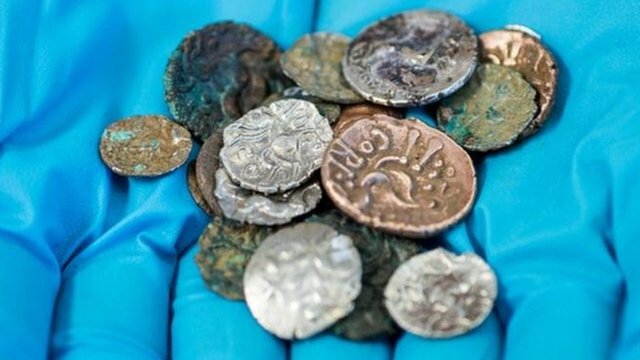 National Trust archaeologist Rachael Hall said: "The coins would suggest a serious amount of wealth and power of the individual who owned them. "Coins were used more as a symbol of power and status during the Late Iron Age, rather than for buying and selling staple foods and supplies. "Was an individual simply hiding his 'best stuff' for safe keeping? Or perhaps speculating, in the hope that the value would increase in the future, like a modern-day ISA?" She said the situation of the cave could not be ignored. "Could it have been a sacred place to the Late Iron Age peoples that was taboo to enter in everyday life, making it a safe place that would ensure that person's valuables were protected?" 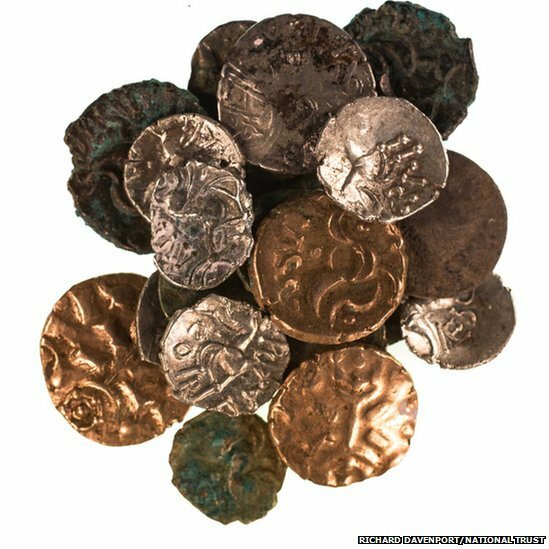 The largest hoard of Iron Age gold and silver coins ever found in Britain was discovered by an amateur archaeologist in 2000 near Hallaton in Leicestershire. More than 5,000 coins, jewellery and a silver-gilt Roman parade helmet were among the treasures discovered during that excavation. The British Museum's curator of Iron Age and Roman coins Ian Leins said that while this latest find at Reynard's Cave and Kitchen did not quite match the Hallaton discovery, it was "exciting". For the first time, the National Trust enlisted the help of wounded ex-soldiers returning from Afghanistan to assist with the excavation.